Among the vehicles sported by Hyundai at the SEMA show in Las Vegas this week is a beefed up Veloster Turbo painted a striking shade of yellow… or is it green? 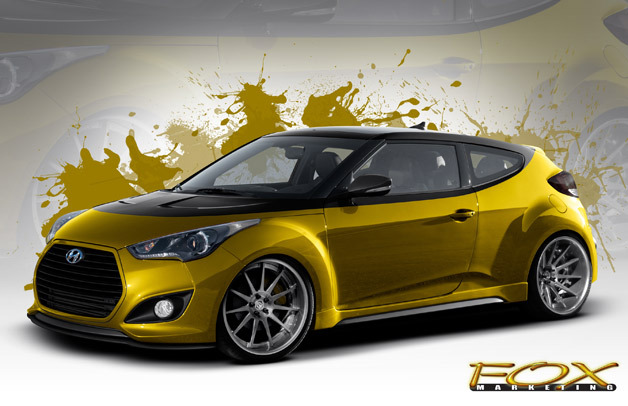 The Korean auto maker teamed up with Fox Marketing to create a Veloster Turbo with an additional 169 horsepower thanks, in part, to it’s 101-octane racing-fuel powered engine. You can’t miss it, even when it’s sitting still! 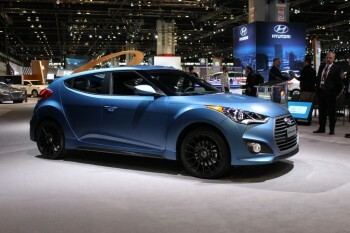 To read all about the SEMA-worthy Veloster Turbo scroll down for the full press release. To learn about the other vehicles Hyundai’s presenting at the Specialty Equipment Market Association event click here. SEMA runs through this Friday, Nov. 8th. 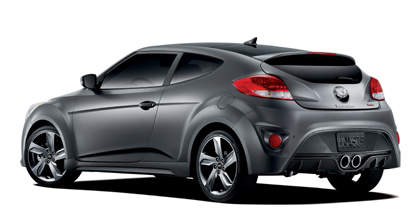 COSTA MESA, Calif., Oct. 23, 2013 – Hyundai has joined forces with Fox Marketing Cars to create the most powerful street-focused Veloster Turbo ever. The car will be showcased at the 2013 SEMA show in Las Vegas, November 5-8. Fox Marketing leveraged the outstanding reliability and performance potential of Hyundai’s 1.6-liter, 4-cylinder direct-injected, turbocharged Gamma powerplant as the core of its SEMA concept. A comprehensive package of advanced engine components, including a new 845 Motorsports turbo upgrade, BorgWarner EFR turbo, front-mounted intercooler, AEM water/methanol injection system, VP Racing 101-octane performance fuel and an ECU tune from SeoulfulRacing, boosts output to an impressive 370 horsepower. The addition of a UNIQ Performance strut brace, ImportShark chassis bracing and fully-adjustable ARK Performance coil-over suspension ensure the Fox Marketing Veloster Turbo puts all that power to the tarmac and keeps it flat in high-speed cornering, while new Street Pro LE seats and Takata Drift III 4-point harnesses hold the driver firmly in place. Braking performance has been improved with WP Pro EX6 6-piston front calipers with carbon fiber ducting and 13.6-inch wavy-cut rotors for neck-wrenching stopping power. Exterior modifications give the Veloster Turbo an aggressive demeanor that perfectly complements the engine and chassis upgrades. A hand-mixed paint from BASF color lab dubbed R-M Oynx HD Waterborne SkyAqua Pearl is the most striking exterior component, while the addition of Hyundai Genesis fog lights, an ImportShark front lip spoiler, custom rear fascia mesh and custom front fascia round-out the bold exterior modifications.